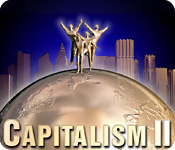 Capitalism II is rated 3.5 out of 5 by 8. Rated 5 out of 5 by chetongueek from Oldie and Goodie I bought the original Capitalism about 15 years ago and played it quite a lot. When I saw Cap II on Big Fish, I was excited and downloaded the trial. Unfortunately, there weren't a whole lot of upgrades in visuals or player experience. The close up screens of the buildings and inside the stores haven't really enhanced the game for me. So, I didn't purchase the full game. Recently, I really wanted to play the original, but it just doesn't run on Windows anymore. I gave in and bought Capitalism II. I am still getting reacquainted with the game, and maybe I will see more of the upgrades as I go, but so far I am just happy to being able to play the game I remember from years ago. I would definitely recommend the game, but be prepared for it to look like an old "dos" game (including fonts). I would also buy an upgrade if one came out in the future that is a bit more current in appearance. 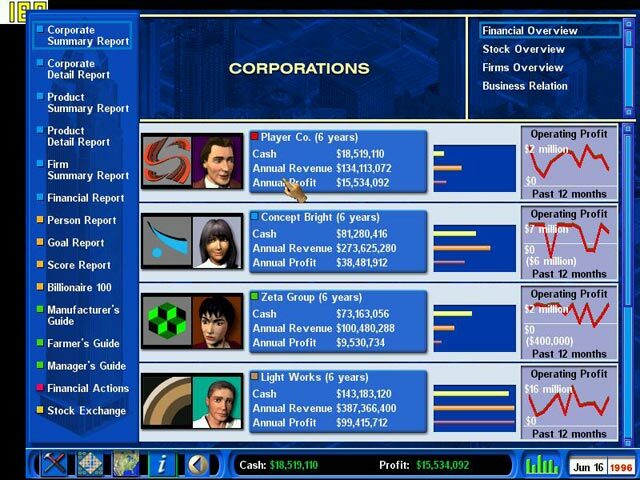 Rated 5 out of 5 by ScrubyLoo from One of My FAVES I've been playing Tycoon games and empire builders for many years, and I first played this game way back in the day. I've beaten it many times through the years, and yes, I would love it if a new version would come out. But I still love to play it! This is not a simple game and there is a bit of a learning curve, but once you get it, you are hooked. I've even read reviews where professors have made their students play this game to teach them economics. The curve is rough, just like in real life. Definitely a great game, but this is not a child's game. 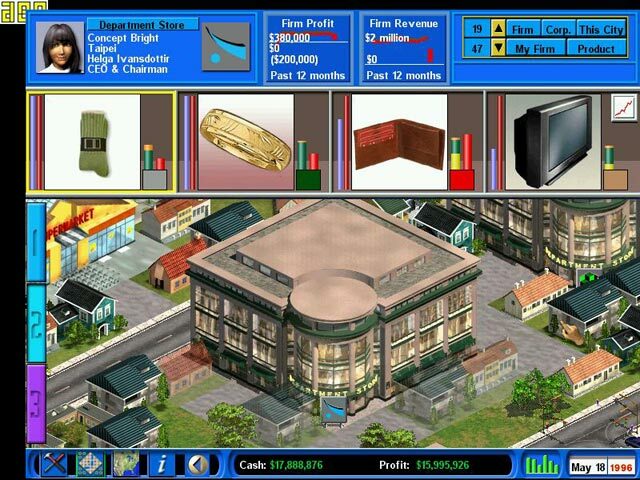 Rated 5 out of 5 by realfeel from Great economic simulator One of my favourite games. Graphic is not important. 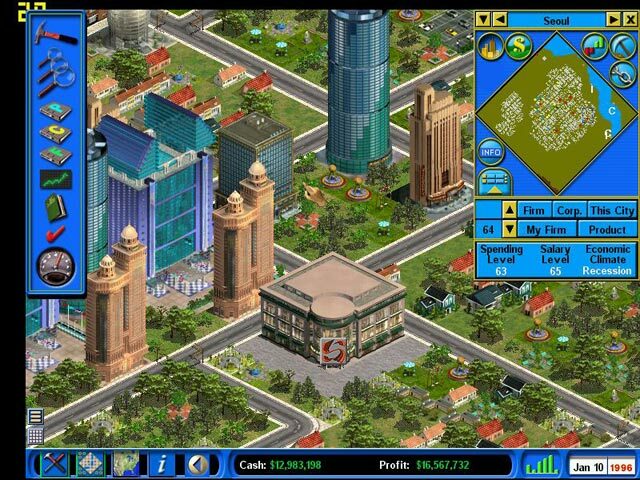 The simulation contains a lot of possibilities how to affect the city economic, it is very addictive. Rated 5 out of 5 by AlbertoROSA from perfect My favorite game. It should be lauched as a new version. Rated 4 out of 5 by pses from Challenging sim-type strategy game! This is a sim-type stragegy game. You begin in Pittsburgh, and own a retail store. You purchase more, choosing locations, products, suppliers, and can expand into other areas. You can purchase land, buildings, and more. It's kind of technical in the beginning, learning how the game works, which can be cumbersome, however, it's very challenging and absorbing. For any sim-style game fans, you'll really enjoy this! Rated 2 out of 5 by coffeeguy from Interface is Sometimes Unresponsive I played this for about 40 minutes.To start, I chose to own grocery stores. What is very odd is that each store only sells four products. The look of the game is very old, I thought. Even the dialogue boxes looked retro. Then, I thought maybe this was on purpose. That was, until I came across an item I could stock in my supermarket - a VHS tape recorder! VHS has been gone for so long! So that, along with the look of the game and the difficulty using it made me decide that this was not for me. The response problem was not occasional. I had to click arrows for drop-down menus over and over for them to respond. The same goes for some of the buttons. I hope they re-do this game using today's technology - it seemed like it could be fun. Rated 1 out of 5 by rballeau from No instructions on how to play I couldn't figure out what I was supposed to do. It looked like it might be a good game but I'll never know. Rated 1 out of 5 by bertiepuppy from Garbage Game Instructions to play the game would have been nice e.g. what to do to even start. Would have given zero stars but that isn't an option.